Ralph was hand raised from a baby by my friend Lisa. I adopted Ralph from Lisa who felt he was not getting the attention he craves at her place. I admit was a little reluctant to take him on. I already had Corey and Morticha and was not sure about how two older pets would appreciate adding a bird to the mix. Especially one that requires so much attention. I have owned Lorikeets before and familiar with their special dietary, physical and mental needs. But Oh boy, nothing prepared me for Ralph ‘Mouth’! 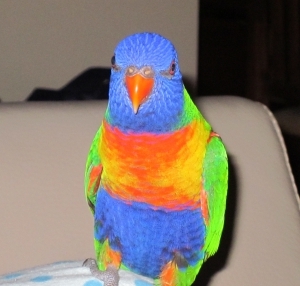 Firstly, his colours are just stunning, I’m sure much brighter than any Lorikeet I have ever seen. He is a little vain – constantly grooming and preening himself for all his lady fans. Ralph is also loud, messy, attention seeking, manic, unpredictable and tries his hardest to make you laugh. Which you can’t help but do…this however, only encourages him to orchestrate much crazier stunts! I wonder has any study been done on Attention Deficit Disorder in birds? During the day Ralph lives outside on the patio where he swims in his bath (or rather bomb dives into his bath), plays with his many toys, enjoys the daily array of fresh native flowers I collect from my morning walks and chats to the various bird visitors he has through out the day. He is quite popular with the local ladies and I think sees himself as a bit of a catch. Ralph is however an immense sook. When the sun starts to set, he calls out to me over and over until I bring him inside for the night! As soon as you bring him in he scrambles into his little faux wool bed that hangs from the top of his house and rolls onto his side to go to sleep. No wild bird resides at my place – Ralph likes the finer things in life! He loves that bed….I just wish I knew just how much he loved that bed when I first brought him home. On that unforgettable day, I had fervently collected branches that had dropped from various native trees around my area. They varied in diameters and all had thick rough bark covering them – which I thought to myself Ralph would love to destroy (to be honest I was actually thinking ‘oh this will be such good beak health’ – did I miss my calling?). I measured up the branches, used a hand saw to cut them all into various lengths required to make many different levels in his new home. After then carefully placing all of the branches, native flowers and his toys throughout his house, I finished it off with his little faux wool bed. I stood back and thought ‘wow this looks like such a cool home’. I took Ralph out of his ‘transporter’ and placed him into his new home. I was thrilled he seemed to love it instantly. He started instinctively pulling the bark off of the branches and investigating all of his new toys. I then realised that his little bed needed to be moved as he was having trouble climbing in. All seemed to be going quite well as I had one hand inside his house and the other outside attempting to unscrew the little catches. Ralph watched nonchalantly at first, as if waiting for me to be in a compromised position. In an instant I noticed his pupils suddenly dilate and then WHAM! He tore across his new grand abode wings spread and screeching, latching onto my knuckle and biting down hard. It took me a few seconds to get him loose. I was left with bleeding knuckles and a puncture wound that felt like it hit bone. The next day Lisa informs me ‘Oh I forgot to tell you, Ralph doesn’t like it if you touch his bed’. A handy little piece of information that would have been nice to know YESTERDAY! The Most PAWsome Event Of The Year…Is Almost Here! Previous story Happy-er New Year 2013!!!! !